"At the moment, everything splits through this Framptone to the three amps and then comes to each of these SGI boxes - radio SGI boxes. This is mostly for the fact that the cable run is so long from here and back to the amps. Although, in an attempt to try and consolidate and compact everything I think I may just end up actually just taking this away and having it at the back of the rack. So it would just have one out from the board which will run from one SGI box to another, and then I'll split that behind the amps. Yeah we've got festivals coming up and all this takes a long time to plug in," says Josh Klinghoffer's guitar tech. 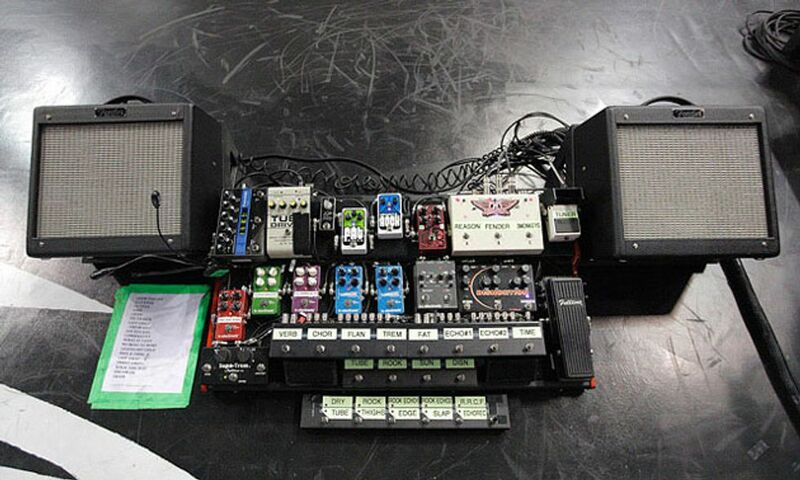 According to Premier Guitar's [rig rundown](http://www.premierguitar.com/articles/Rig_Rundown_Aerosmiths_Joe_Perry_and_Brad_Whitford), Brad Whitford uses a Framptone Switcher. "I use a Framptone 3-Banger to send one signal to the house, one to an Ampeg rig, and another to a Roland JC- 120. Even without the stompbox, there’s still plenty of overdrive going on in the amps. I never use a clean, Dave Matthews Band kind of bass sound—ever." In this pedalboard photo posted by Cheney on his Instagram account, one of the pedals that can be seen is the Framptone The 3-Banger. No reviews or videos yet for Framptone The 3-Banger Footswitch. With an Equipboard account you can rate this item, add it to your collection, submit a review to discuss what you like and dislike about it, and associate Framptone The 3-Banger Footswitch to artists that use it. Create an account!